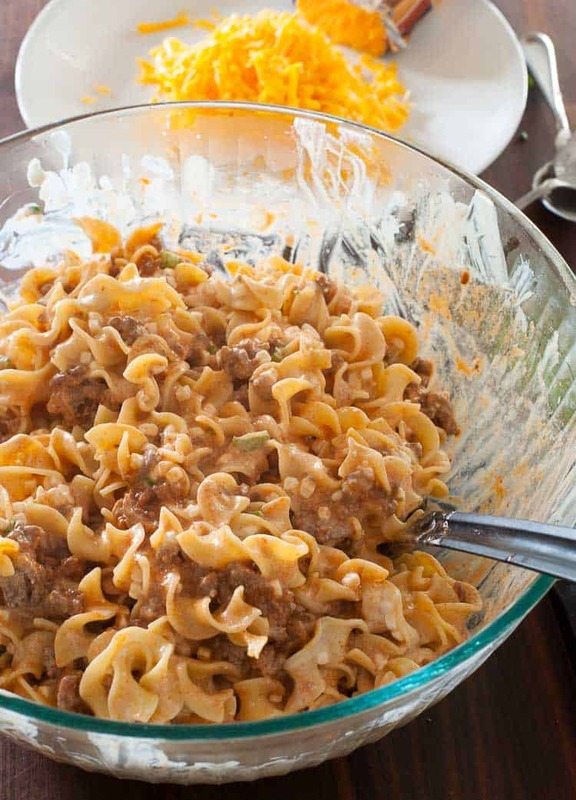 Here’s a no nonsense recipe for a cheesy beef noodle bake that everyone will love. From start to finish it takes less than an hour to make. Any recipe that says noodle bake has got to get your attention. Just think of a satisfying meal…yummy flavor…cheesy aftertaste…great leftovers. Let’s get started. Preheat your oven to 350°. Then heat up some water to cook the noodles in. Once boiling they take about 10 minutes to get to al dente, but follow your label instructions. In a good sized skillet, brown the ground chuck. When this is done, skim off most of the fat. After that, pour in the tomato sauce and some salt and pepper, stir it together and let it warm up for 4 or 5 minutes. In the meantime, grab a medium sized bowl and mix the sour cream and cottage cheese together. Then add 4 chopped scallions. 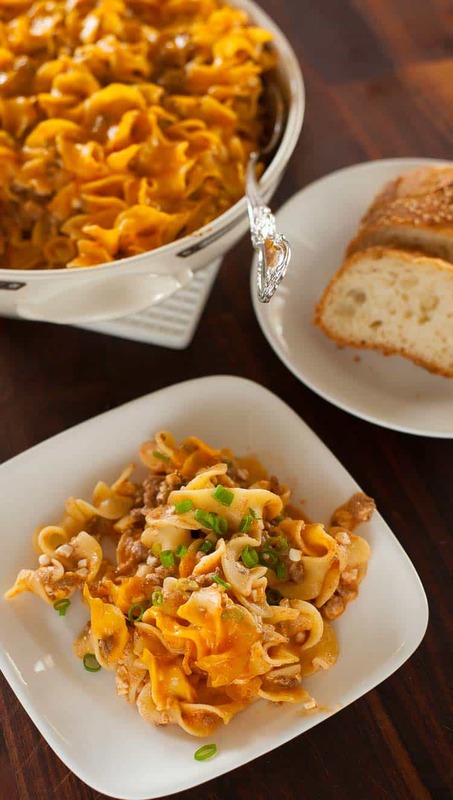 As a side note, this recipe has similar ingredients as my Meatless Cottage Cheese Lasagna recipe, except that this beef noodle bake takes a lot less time to make. 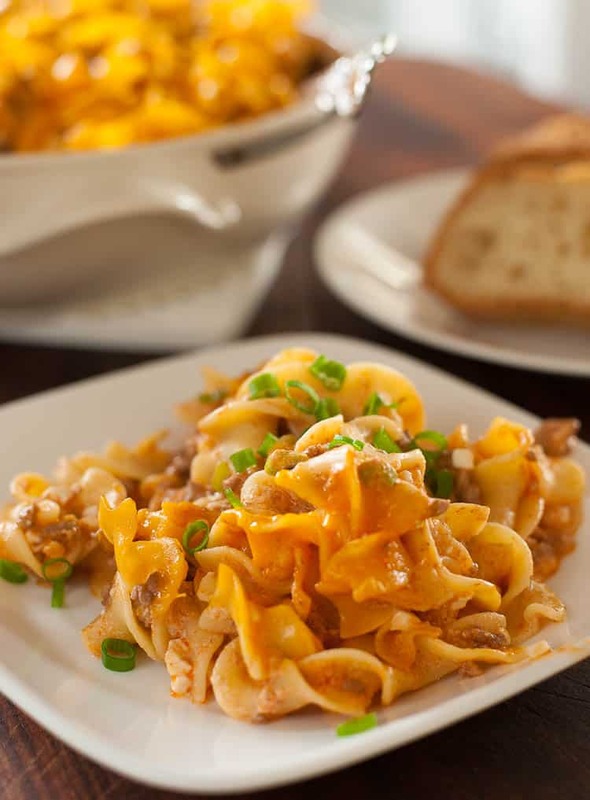 You’ll need some grated sharp cheddar cheese to top the noodle bake. 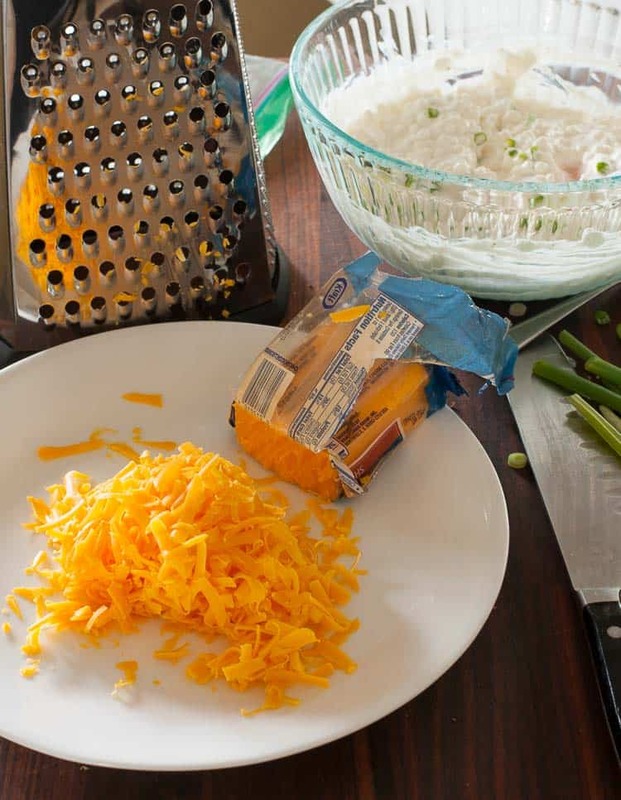 Grating your own cheese will give you much more flavor than buying the pre-grated stuff. Drain the noodles and put them into a large bowl. Pour the cheese mixture in and stir together well. This is where I give it a taste…who’s going to miss a few noodles? Finally, add the ground beef and sauce, stir it together well. Spray a 1 1/2 to 2 quart casserole dish with cooking spray , then pour in the noodle bake. 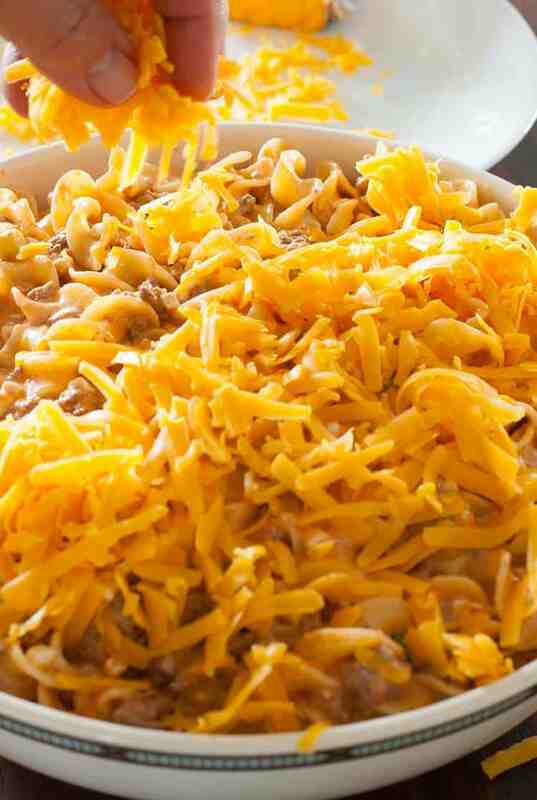 Top the casserole with shredded cheese and put it in the oven for 15 to 20 minutes to melt the cheese. When you take it out of the oven, it should be at just the right temperature for eating. All of these steps will take you 50 to 55 minutes. 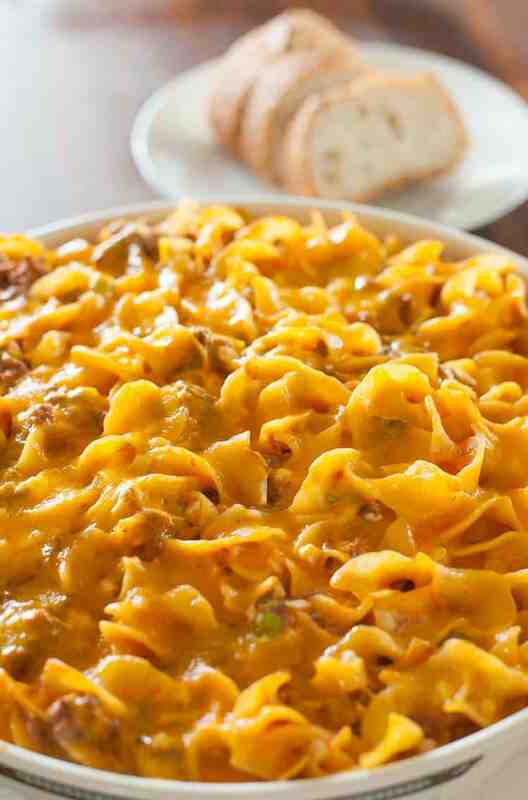 Serve the cheesy beef noodle bake with a good crusty bread. You see that I’ve got mine all ready to eat. This recipe is easy to make and the only seasonings used are salt and pepper. If you’d like, you could add a little Italian seasoning or some crushed red pepper flakes. I like the simplicity of this and the flavors are satisfyingly good. Give it a try. Super easy main course recipe using simple ingredients. Boil the noodles to al dente according to package directions, drain and reserve. At the same time, brown the ground chuck in a large skillet, (about 10 minutes). Skim off the excess fat. Add the tomato sauce, salt and pepper to the meat, stir together and heat for 4 to 5 minutes. 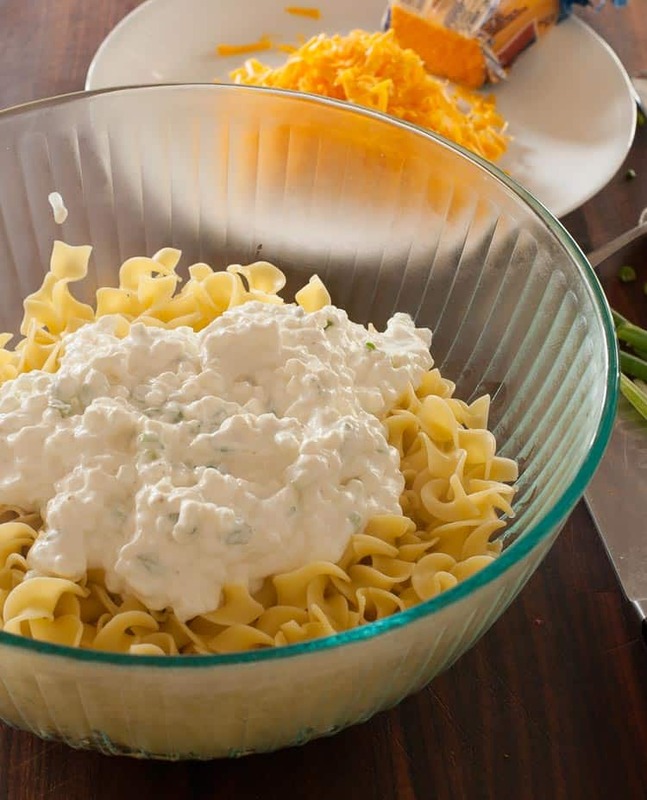 In a medium sized bowl, mix together the sour cream and cottage cheese, then add the chopped scallions. Place the cooked noodles into a large bowl, stir in the cheese mixture, then the meat sauce. 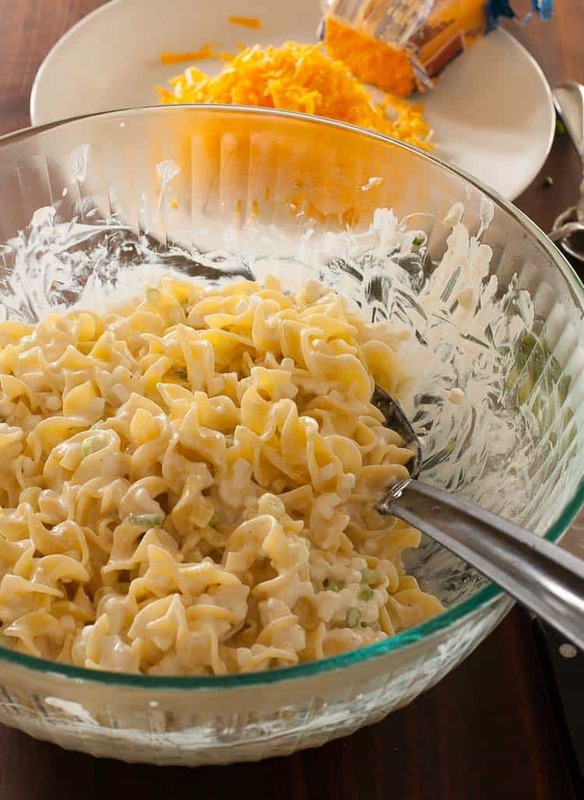 Spray a shallow 1 1/2 to 2 quart casserole dish with cooking spray, then add the noodle bake ingredients. Top the casserole with grated cheese and place in the oven, 15 to 20 minutes until the cheese is melted. Adapted from Ree Drummond, The Pioneer Woman. This looks delicious! Perfect comfort food! This is a variation of one of my favorite hot dishes. It has all the right stuff to bring out the Scandinavian in me!